Coventry Blaze coach Chuck Weber has signed to stay with the Elite League Play-Offs champions for another season. After his success in leading the Midlands side to their first trophy in five years, the 42-year-old American is aiming for more silverware in 2015-16. "I am excited to be back for another year and build on the strong finish from last season," he said. "We have already made good progress securing the signing of returning players to give us a strong nucleus." Director of hockey James Pease said "Securing Chuck for another year is a huge step forward for us. "Finishing with some silverware after coming from where we were at Christmas was a fantastic feeling for everyone at the club and was made possible by Chuck being at the helm. Now we must move forward and use last season's success to propel us in our hunt for more silverware." Coventry Blaze were in ninth place in the Elite League in December. when Chuck Weber took over. He lifted them to sixth, to earn a place in the play-offs, and they went on to beat Belfast Giants in a semi-final shootout, then Sheffield Steelers 4-2 in the final. New York native Weber, who was head coach with Kontinental Hockey League side Medvescak Zagreb prior to joining Blaze, was East Coast Hockey League coach of the year in the United States in 2007-08, when he enjoyed the first of two Kelly Cup wins with Cincinnati Cyclones. Weber added: "Although I have only just agreed terms I have been working with James Pease over the last couple of months beginning the process of putting together a team Blaze fans can be proud to support. "We have the chance to win five pieces of silverware this season, with two competitions giving us a route to the Champions League." 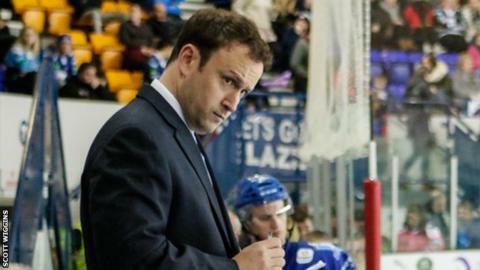 Meanwhile, former Blaze coach Paul Thompson, under whom Coventry won the Elite League four times in six seasons between 2005 and 2010, has joined Sheffield Steelers as head coach and general manager. The former Great Britain boss still has connections with Coventry, one of Sheffield's major Elite League rivals, but Blaze chairman Andy Buxton insists this is not a cause for concern. "There's no issue," Buxton told BBC Coventry & Warwickshire. "He's a small shareholder with the club, not a director, who doesn't run the club. "Blaze will always have a place in his heart, but there's no conflict of interests. You can own shares in one company and run another."